“Eloquent Objects: Georgia O’Keeffe and Still-Life Art in New Mexico” deftly places her still-lifes in the context of other artists who used the atmosphere and symbolism of the Southwest. Georgia O’Keeffe — that masterful painter of the depths of flowers and the expanses of deserts — often spoke of the difficulty of creating “an equivalent” to reality. The current exhibition at the Tacoma Art Museum (the only West Coast stop), examines O’Keeffe’s still-life paintings as equivalents for the beauty and wonder she found in New Mexico. 10 a.m.-5 p.m. Tuesdays-Sundays through June 7, Tacoma Art Museum, 1701 Pacific Ave., Tacoma; $12-$14 (253-272-4258 or tacomaartmuseum.org). Note: The museum is open until 8 p.m. on Thursdays through June 25. Curator Charles C. Eldredge, former director of the Smithsonian American Art Museum, deftly places O’Keeffe’s still-lifes in the context of other artists who used the atmosphere and symbolism of New Mexico. It’s a great topic for a show, allowing us to reconsider O’Keeffe’s work, to get to know some lesser-known artists and to contemplate what a still life is. The still life — an arrangement of inanimate objects — has been around for centuries. The ancient Romans frescoed still lifes on their walls, 17th-century Northern Europeans rendered exquisite paintings of fruit and flowers that reminded them of the ephemerality of life. During the first few decades of the 20th century, Modern artists — of whom O’Keeffe was a leading American figure — used the age-old genre to grapple with the tension between observation and representation. O’Keeffe continued this exploration throughout her long life. In New Mexico, where she’d visited beginning in 1929 and where she settled permanently in 1949, she found ample form and meaning in the sharp landscapes, chunky adobe buildings and bleached animal bones. Most people will probably go to this exhibition for the O’Keeffes, as did I. However, I was nervous that I’d encounter a bait-and-switch. Sometimes exhibitions will headline a famous name when, in fact, that artist is represented only by a few works of lesser quality. That’s not the case here. 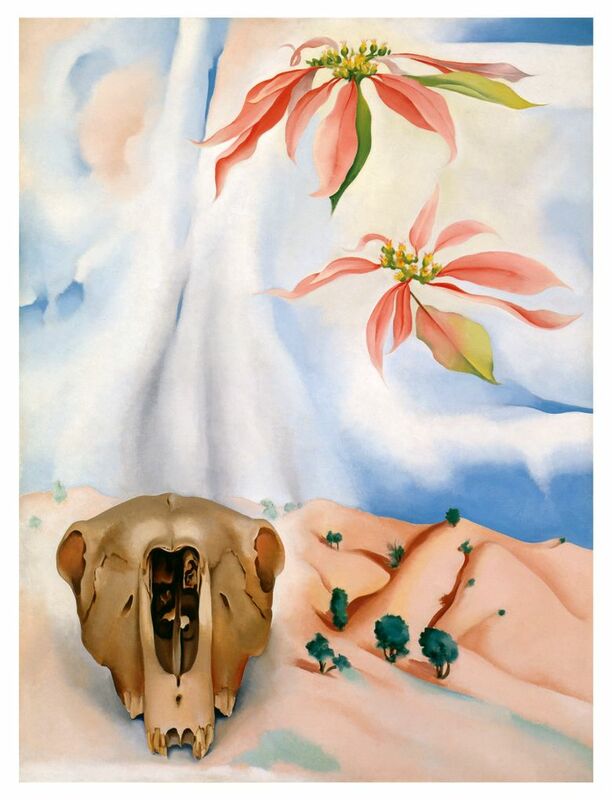 O’Keeffe fans should be thrilled by the presence of 22 works, and satisfied by the inclusion of such iconic subjects as florals and skulls. 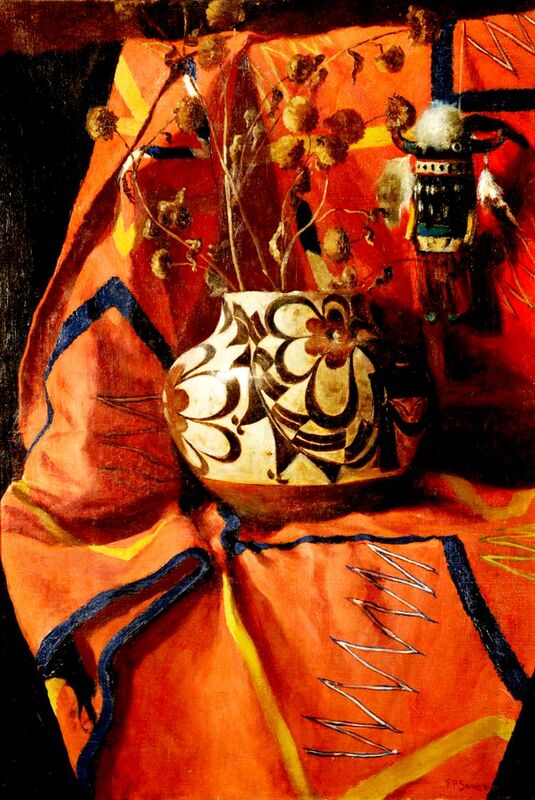 I was particularly impressed with the variety of O’Keeffes — from the bold abstraction titled “Black, White and Blue” to the charmingly realistic “Turkey Feathers in Indian Pot.” Even her most familiar motifs are filtered through the light of still-life questions. Can the side of a building with a dark void of a door be considered a still-life? How about a flower floating across a desert landscape? These questions make us think about what she selected from her everyday life and how she arranged it. It is an exhibition about representing the objects of a specific place within the space of a canvas. While O’Keeffe featured buildings and the bones of animals she encountered on her endless walks, other artists in the exhibition chose more traditional still-life fare: violins, bowls, bouquets. Wonderful paintings by Jozef Bakos also function as self-portraits as he reveals, for example, an intimate view of his kitchen table. Other artists focus more directly on the area’s cultural heritage. You’ll encounter Kachina dolls, Southwest textiles, ceramics and crucifixes. An unusual Marsden Hartley painting from 1918-19 features a grouping of colorful saint figurines. Describing himself as “an American discovering America,” Hartley spent a year and a half in Taos, one of many East Coast artists lured by the vast vistas and open skies. Victor Higgins — my new favorite old artist — wasn’t a Modernist, but he, too, was inspired by the local culture and powerful scenery of New Mexico to create what he felt was uniquely American art. His 1928 oil painting “Petunias” is simple, vivid, charming and moody. Higgins was an early member of the Taos Society of Artists, one of several art collectives that blossomed during this time. Other key figures who helped shape the New Mexican art centers, including Gustave Baumann, Catherine Critcher and Eliseo Rodriguez, are aptly represented in this show. A still life can be a simple apparatus: a collection of forms and colors to explore. But it can also correlate the objective world with subjective states of being. O’Keeffe’s search for equivalence was driven by this elusive balancing act. She once said, “It takes courage to be a painter. I always felt I walked on the edge of a knife.” The best of her still-lifes exude this precision; they are abstract and naturalistic, transcendent but present, of this world and of her own.